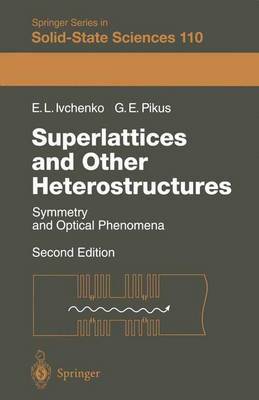 Dealing with optical properties of superlattices and quantum-well structures, this volume emphasizes the phenomena governed by crystal symmetries. After a brief introduction to group theory and symmetries, methods to calculate spectra of electrons, excitions and phonons in heterostructures are discussed. Further chapters cover absorption and reflection of light under interband transistions, cyclotron, and electron spin-resonance, light scattering by free and bound carriers and by optical and acoustic phonons, polarized photoluminescence, optical spin orientation of electrons and excitions, and nonlinear optical and photogalvanic effects.